Out-of-service escalator at Bethesda Red Line station. It seems as if D.C.'s once vaunted subway system has been in the headlines for all the wrong reasons lately. Metro has taken a real beating. The punches just keep coming: The NTSB's scathing report on Metro's lack of a safety culture following the deadly Silver Spring crash; the numerous escalators out of service for repairs; the confusing and problematic fare increases; and another black eye recently from a big brawl between a group of teenagers that spilled into the Metro system. And I can tell you first-hand from riding the rails in the D.C. area after living in California for nine years that the atmosphere amongst commuters and Metro staff is demoralizing and uneasy. But from great challenges and crises should come not despair, but a renewed commitment to right the ship and make Metro again the envy of the world. That is why personally I'm optimistic about the future of Metro for a few reasons. 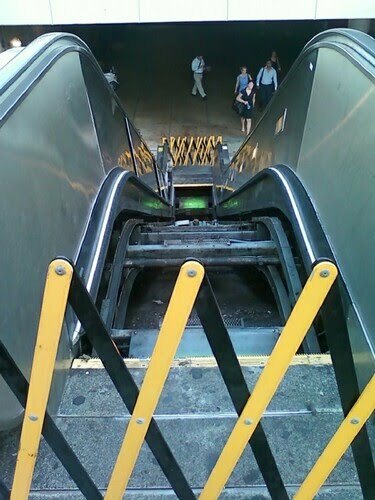 Secondly, let's face it -- the escalator problem is huge. 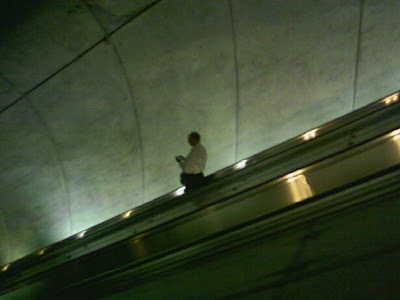 According to the Washington Post, Metro has 588 escalators -- the most in the Western Hemisphere. And they are showing their age by breaking down frequently and needing to be put out of service for repairs. This happens at one time or another at nearly every Metro station on the system. 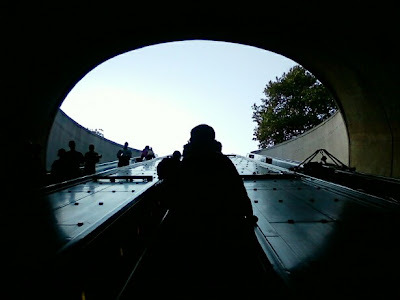 "Starting in the spring, as part of a Red Line rehabilitation contract, Metro will overhaul 46 escalators, replace six escalators and rehabilitate 22 elevators at the Dupont Circle, Farragut North, Metro Center, Gallery Place, Judiciary Square, Union Station and Foggy Bottom stations, said Jeffrey Griffin, project manager for Metro's Office of Elevators and Escalators. As part of the Blue and Orange Line contract to be awarded this fall, Metro will rehabilitate 90 escalators, replace three escalators and overhaul 22 elevators." "Metro hired a consultant, Vertical Transportation Excellence, last month for an initial fee of $75,000 to assess escalator maintenance practices, targeting four stations where outages have been a problem: Bethesda, Woodley Park, Dupont Circle and Foggy Bottom, Kubicek said. Their report is due in two months." Thirdly, despite its current problems Metro is saving millions of gallons of gas and preventing millions of pounds of greenhouse gas emissions from entering the atmosphere by taking commuters off the roads. As of the first quarter of 2009 the daily ridership total was 801,400. So it is important to remember that Metro is helping save the planet one passenger at a time. Lastly, Metro is entering the second decade of the 21st century full steam ahead with the construction of the Silver Line to Tysons Corner and eventually to Dulles International Airport and the plans to order the 7000 series train cars to replace the 1000 series rail cars and eventually zip passengers from downtown to Dulles.